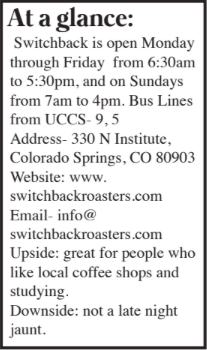 Until very recently, Switchback Coffee Roasters has been somewhat of a hidden gem in the Colorado Springs coffee scene. DelGrosso said he has plans to expand his concept into other locations throughout the city and notes UCCS would be a great venue for Switchback. Aside from being a roastery that claims the importance of ethical and sustainable practices, Switchback posts the costs paid for coffee sourced on their website, and Mr. DelGrosso appears to have a healthy rapport with his customer base and his staff. “The recent national awards given to Switchback are just the beginning,” said DelGrosso. He is hopeful Switchback garners more recognition both locally and nationally in 2019. At the 2018 United States Barista Championship in Seattle, an annually held and highly competitive event, Switchback barista and coffee roaster, Sam Neely, recently placed sixth in a competition which scored baristas on espresso, cappuccino and a signature drink. Evan Browning, another barista and roaster for Switchback, also won at the United States Roaster Championship, placing second overall in 2018 for his skills as a roaster, and for his “Natural Gesha pour-over,” a Columbian-sourced blend of coffee Browning roasted personally on site in Colorado Springs. “I transported [the coffee] to Seattle for the competition,” said Neely. 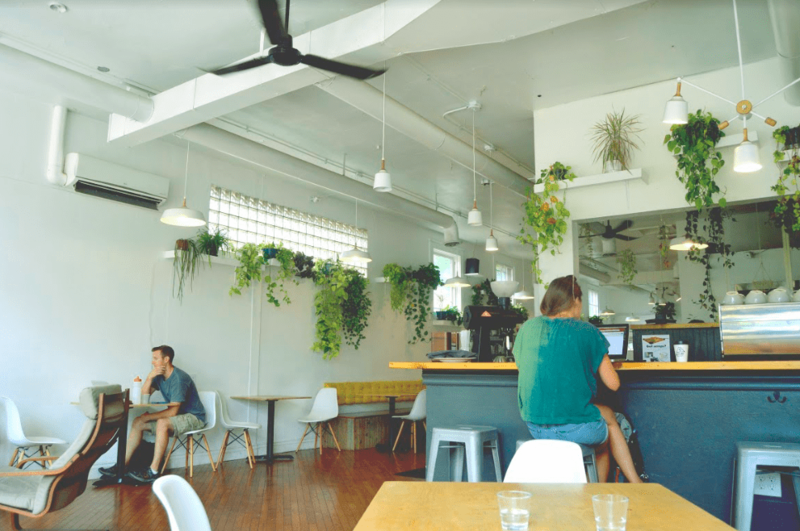 If you’re looking for excellent coffee, for everyone, and a safe place to study, you have several options to get there: from the bus, the car, to Pike Ride and a local bicycle rental service that has a service station in front of Switchback. Stop in and see one of the baristas for a coffee tip, then get your study or your conversation on. “The Avocado Toast is a crowd favorite, and it can be made vegan as well,” said DelGrosso A great summer drink DelGrosso enjoys is an iced latte; “the perfect creamy drink for a hot day,” he said. “Come down and ask him for a cappuccino because they are simply my favorite,” said, Sam Neely, 2018’s sixth best barista. “Once you’re here, you’ll stay, because Switchback is a chill, hip and entertaining place to be, but we think you’ll come back, because Switchback is also an ethically-minded local business,” said Neely.